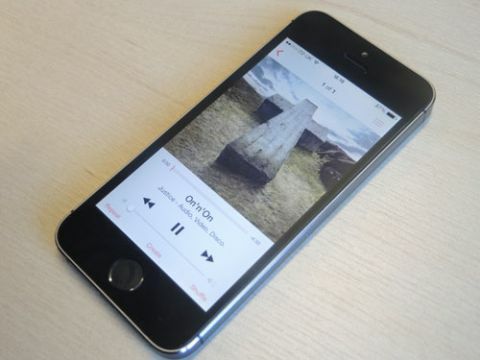 Apple iPhone 5S review | What Hi-Fi? The iPhone 5s has the same build, same-sized screen and same eye-watering price as last year's iPhone 5 – and yet it's still the most exciting smartphone launch of the year. How has the iPhone 5s managed to do that, when Apple hasn't been playing the numbers game like everyone else – be it Samsung packing extra pixels into its screens or LG offering support for hi-res audio? The gap between what Apple is doing with the iPhone and what everyone else is doing just became a full-on, yawning tech chasm – yet still the iPhone 5s remains an impressive contender. No other handset offers such fine picture quality on a 4in screen, for starters. Audio is equally spot-on, leaving even the specced-up LG G2, sounding a little lacklustre. And with the fresh iOS 7 redesign, a fingerprint scanner that has bags of potential, and some very clever processing going on under the hood, there's still plenty of appeal to Apple's now premium smartphone (now joined as it is by the plastic iPhone 5c). The 5s looks and feels almost identical to the iPhone 5, but now comes in silver, gold and the regular 'slate grey', along with a host of colourful new official iPhone 5s cases. Aside from these new finishes, however, there aren't too many design tweaks to get to grips with. Wonderfully crafted from anodized aluminium and durable glass, its angular form isn't quite as ergonomic as curved handsets such as the LG G2 and HTC One. But its size works in its favour – the 4in 5s looks positively miniature next to the 5.2in G2 and 5in Galaxy S4 – and no matter how small your hands are you'll be able to grab the 5s all the way around. That's handy if you're worried about dropping it. The iPhone 5 doesn’t take too kindly to being treated roughly, and we'd recommend being careful with this handset unless you want to hide its modern classic design under a tough case. The 5s may not have the G2's engaging, almost-zero-bezel, all-screen effect or the HTC One's distinctive details, but as well as been creak-free and easy to use one-handed, it's just as light as its predecessor at just 112g. That's considerably lighter than its hefty 140g+, bigger-screened Android rivals and is even more impressive when you stop to consider that Apple has overhauled the iPhone's innards considerably. The lightning connector port stays and the remaining slight differences in design consist of a second flash, dubbed True Tone, next to the 8MP camera on the rear – more on that later – and a slight tweak in the colouration of the 5s's metal sides. Finally, there’s the new, flatter home button, which has a visible ring around it on the gold and silver models, and now acts as the 5s's futuristic fingerprint scanner. Touch ID brings a whole new dimension to the iPhone. First, it's easy to get going and the 5s will give you the option to scan in your digits as soon as you set up the handset. It will take a minute or two to scan in five fingers but that's it. Instead of tapping in a pass code, just press the home button and keep your finger or thumb down for a second to unlock the iPhone 5s. You can also authorise iTunes music and movie downloads and App Store purchases with just a press of your finger as opposed to keying in your Apple password. If you've never been particularly worried about your iTunes or App Store passwords being compromised, Touch ID might seem like a step too far. But Apple has addressed privacy concerns by confirming that fingerprints will be stored on the phone itself and not on central servers. Not to mention the potential for this feature: if Apple pushes its Bluetooth iBeacons set-up, Apple's take on NFC, we could see secure mobile payments authorised by a press of a finger in a matter of months. NFC (near field connectivity) technology has been promising this for years but with the iPhone involved, we’re now perhaps more likely to get there a, erm, touch quicker. Apple seems a little stuck in its ways about the iPhone’s screen. Last year we finally got the leap to 4in from 3.5in, but it seems Cupertino doesn’t agree that bigger is better when it comes to smartphone displays. It comes down to personal preference, of course, but we think the HTC One’s 4.7in full HD screen hits the sweet spot for watching movies on the go – if you're not going the whole hog and packing a tablet that is. As well as sticking at 4in, the 5s’s Retina display is also the same resolution as that on the iPhone 5, so it loses a little compared to sharper screens when viewing hi-res images or watching 1080p HD movies. There’s not much in it but devices like the LG G2 will offer you a cleaner, crisper picture with greater contrast. Still, we really like the iPhone’s colour palette as it offers up natural-looking skintones as deftly as it handles vibrant hues, demonstrated nicely in Star Trek Into Darkness. Compared with the iPhone 5, motion is a touch smoother and there’s a smidge of extra detail so it’s not fair to say it’s exactly the same screen in performance terms. For web browsing, whites are Persil-pure though and the 5s’s screen is fairly readable in sunlight too – the new quick access to brightness settings in iOS 7 will help make adjustments on sunny days. Something like Long Lost by Classixx shows a level of subtlety with music and voices that can't quite be matched by other flagship smartphones. It might go against the specs but if you can compromise on the smaller screen, Apple has you covered on sound for music and movies alike. Make sure you buy the most storage you can afford - from a choice of 16, 32 and 64GB – as, once you fill up the iPhone with large audio files, you won't be able to expand the storage via microSD cards. The bundled Apple EarPods are much better than their predecessors, but we’d still recommend upgrading to a pair such as the excellent AKG K451s to get the most out of the iPhone’s audio prowess. The built-in speakers are placed on the bottom of the iPhone 5s as before and give you a fairly powerful sound. But we'd go for the forward-facing speakers of the HTC One for crisper audio from the speakers. The biggest change Apple has made to the iPhone in 2013 is actually its mobile OS and, unlike the new processor and fingerprint reader, it's also the most obvious. Also available for older models such as the iPhone 5 and iPhone 4S, iOS 7 breathes a breath of fluorescent marker penned air into the operating system – which was admittedly getting a bit stale. It’s as simple to use as ever, with grids of icons on your homescreens as before. New functions include AirDrop – a beautifully simple Bluetooth sharing feature to rival Android's options – automatically updating apps and a welcome Control Centre that provides quick and easy access to Bluetooth, wi-fi, airplane mode and brightness toggles as well as a basic music player. Control Centre is just one of the features that behaves in an almost identical way to rival operating systems, in this case Android's pull-down settings menu. Swiping from the left hand side of the iPhone 5s screen to the right in Safari, brings up settings and some built-in apps. And when switching between apps that are running, iOS 7 now has a carousel of cards that will close when swiped upwards. In terms of interface, though, Apple has gone in a completely different direction – compare the crumpled up maps of LG's Android skin and indeed the iOS of old to the bright, bold new iOS 7 and everything else looks dated. Plus downloading apps have a new wheel animation that reveals the icon beneath. It's all very slick and intuitive, and adapting to changes such as swiping down on a homescreen to access the universal search function soon become second nature. The App Store too has had a slight revamp for iOS 7 but as ever, the crucial advantage Apple has is still that it offers a bigger, better-curated, often higher-quality selection of apps that will run perfectly on the iPhone 5s, many of which have already been updated for iOS 7, such as the Sonos app, for example. The same can't always be said for Android, and certainly not for Windows Phone and BlackBerry 10's respective apps stores, which still have large gaps, particularly in music apps and control apps for speakers and smart TVs at home. In some areas, iOS still lags behind Android. There are no inviting widgets presenting easily viewable information straight from your homescreens. And the revamped notifications pull-down can't yet compete with Google Now's almost mind-reading set of location-aware, search-query enhanced cards of traffic, entertainment and calendar information. Siri, too, is still a bit hit and miss and despite improvements to 'his' conversation abilities and tweaks like sending us to Wikipedia rather than Wolfram Alpha, Apple's sometimes frustrating voice assistant still needs work. The iPhone 5s may not have caught up with Android when it comes to real-time updates, but iOS still shines at getting the basics done. That includes the fast and accurate keyboard and the new and improved default Safari web browser. There's still no Flash but otherwise it's now as seamless an experience as Chrome. That means a frameless display with controls for forward, back, sharing, bookmarks and tabs that pop up at the bottom of the screen and you can cycle through recently opened pages using Tabs. As expected, there is no weak link on the iPhone 5s spec sheet and that includes its cameras. The main, rear 8MP iSight camera now has a bigger sensor and a wide aperture of f/2.2 that will let in more light. What does that mean? Brighter, punchier stills in the daytime than you get with the iPhone 5, with realistic colours and incredible contrast plus Instagram-style filters which mean you can't really go wrong with the 5s as a reliable point-and-shoot smartphone. Low-light snaps taken with the iPhone 5s are equally as impressive – among the best we've seen, especially with photos taken of faces, as the added True Tone flash helps night shots look more natural. Not only does the iPhone 5s shoot smooth HD video, it also has a cracking slow-mo mode which shoots your subject at 120 frames per second rather than just 30, allowing you to slow the 720p footage down to export and share using AirDrop, email, Facebook etc. No matter how fast your subject is moving, the 5s's image stabilisation keeps things looking sharp. The new A7 chip is twice as fast as last year’s so the slow-mo videos can be adjusted and rendered on the phone. The iPhone didn’t exactly need a performance boost, considering the closed nature of Apple’s ecosystem and the lack of apps and games that really push it, but the iPhone 5s got one anyway. Both its CPU processor and GPU (that looks after graphics) are twice as fast as last year’s A6 chip and the A7 is also now based on 64-bit architecture . For now, that means the iPhone 5s is able to handle the processing needed for the fingerprint scanner. Eventually it could mean that Apple really does converge iOS with its desktop operating system for one seamless user interface across all your Apple devices. Still, anyone sticking with the iPhone 5 or the cheaper 5c model won’t be missing out on any huge performance boosts – the outgoing iPhone was very smooth and fast to begin with. With any device you’ll see the occasional crashes, but the iPhone is more reliable than most. In terms of battery life, the iPhone 5s can't compete with the likes of the LG G2, but it's possible to get more life out of this handset than the iPhone 5. Either way, the 5s should last you at least a day – when watching video, expect a standard movie to drain 15-20% of your power – but in standby, it lasts and lasts. Once again, the new iPhone confounds expectations. The iPhone 5s beats the LG G2 for sound quality and produces a perfectly good picture despite the smaller screen, while iOS7 is both beautifully designed and bursting with long-awaited functions. The iPhone 5s is Apple's most attractive smartphone to date: it's going to be a close fight between the LG G2 and HTC One for ultimate class-leading status.